The Black-necked Weaver was formally described by Louis Jean Pierre Vieillot, a French ornithologist. This species had been collected by Jean Perrein, a French naturalist, who travelled in Africa and on other continents. 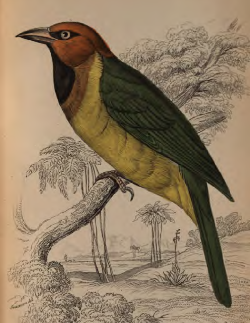 Vieillot was interested in the habits of living birds, but Perrein did not provide any field notes for the Black-necked Weaver, as he had done for the Crested Malimbe. Vieillot also gave a French name to this species, ie. Le Tisserin a gorge noire (meaning Weaver with a black throat). 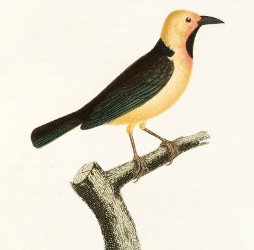 Vieillot described the plumage of the Black-necked Weaver and implied that it had been collected in Malimbe, now called Malembo, in Cabinda, Angola. Perrein sent his specimens to Academy of Sciences in Bordeaux, France, from where the Black-necked Weaver type was moved to the Paris Museum (Swainson 1838). The second illustration of this species to be published, was by Swainson 1837, but this was of the West African race. Malimbus nigricollis	Vieillot 1805	Oiseaux chanteurs, p.74	1805	Malimba, Angola. nigricollis Latin: niger, black; Mod. Latin: -collis, necked. Fernando Po Spectacled Weaver, Kenya Black-necked Weaver, Manenguba Weaver, Swainson's Spectacled Weaver, Swainson's Weaver. Type specimen probably still in the Natural History Museum in Paris.